Ranging from groupings of 1 to 15 gallons to 200+ gallons in size, this photo galleries index is designed to provide you easy access to all of our Top Reef Tank Photos Galleries. These galleries contain lots of top reef aquarium pictures, most of which were submitted by site visitors. Not that many years ago little mini reef tanks complete with corals were typically considered extremely difficult to maintain. Not so anymore. With the advances in reef keeping science, it has become possible for even novices to have successful nano/mini or micro reef tanks like the ones pictured in this gallery. It's amazing as well that many of these mini reefs were converted from fish-only tanks to stunning little reef systems by utilizing powerful mini reef tank lighting retrofit kits. These put-almost-anywhere aquariums are fairly inexpensive to equip and maintain but are still large enough to house a nice selection of corals, invertebrates, and fish. Some of the new, reasonably priced Power Filters work well with these marine tanks as do some of the smaller multi-stage canister filters. As you will see, there are a number of Bow Front and hexagon aquarium shapes available in this tank size range. These tanks are among the most popular sizes. Big enough to get really creative with live rock, corals and fish, these tanks also make great Custom DIY Aquarium projects. These reef tanks have a terrific assortment of corals and fish. Most of these tanks make use of Metal Halide and/or Power Compact lighting. Due to their size, many of these tanks will utilize a sump and/or a wet/dry filter system. This allows for more equipment to be housed out of sight, under the tank. There are some outstanding tanks here, including a 92g corner Bow Front reef tank. Reef tanks in this size range are definite showpieces in any room. Some aquarists choose to stock these tanks with show size fish. These tanks have some of the most fantastic corals you will ever see. The cabinet work on some of these tanks is truly inspiring. These marine aquariums will dominate almost any room and have plenty of space for enough live rock to give all the fish and invertebrates their own house. 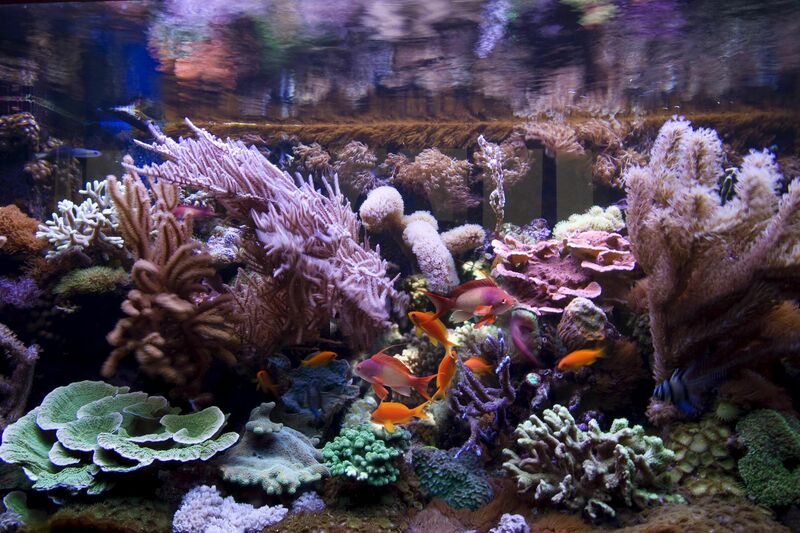 The variety and number of corals in these tanks is truly remarkable. The 200+ gallon marine aquariums are the monsters you can almost swim in. Plenty of room for all kinds of corals, fish, and invertebrates. Most of us can only dream of these tanks. Take a look at the tanks that made dreams come true.